This Down to Earth Woodworker column first appeared in the November 2011 issue of Wood News. To see the rest of the issue, CLICK HERE. Now that the Down to Earth Woodworker has moved into his new workshop, he is contemplating some improvements from his previous shop configuration. The first item he sets his sights on is an ingenious clamp rack that holds the clamps horizontally, saving space and allowing for a lot more flexibility in storage options. 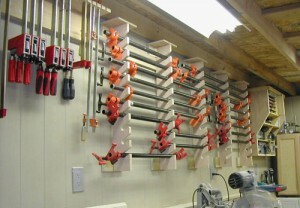 CLICK HERE to read more and learn how to assemble a horizontal pipe clamp rack in your own shop!